Process A split helical coil is used to heat the carbide & circular steel cutter evenly for the brazing application. The circular steel cutter is placed in a vise and the carbide and braze shim are placed onto the tooth. The assembly is heated for 5 seconds to braze the carbide to the circular steel cutter. 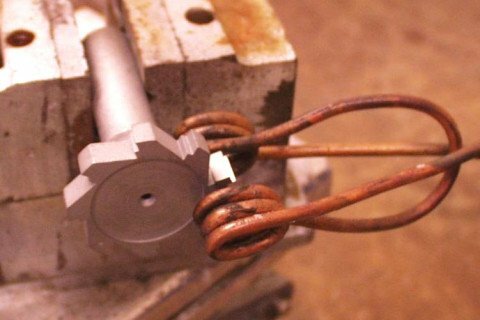 The circular steel cutter is rotated in the vise & each carbide tip is brazed separately without effecting the previous braze.